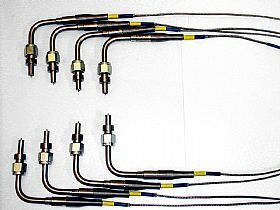 Genuine EGT Pro Series Sensors Kits. To be the fastest most durable in the WORLD! Type �K� Calibration Special Limits, Traceable to N.I.S.T. This Probe is compatible with...Race Gasoline, Alcohol, Methanol, or Nitrous Oxide in naturally aspirated, Turbo charged, Blown/Supercharged Engines and Fixed & Portable Dynometer�s. Exhaust Gas Technologies, EGT sensors are the #1 EGT sensors used in professional Motor sports world wide. We currently supply the top teams in NASCAR, INDY,NHRA, IHRA, BONNEVILLE, and IMSA AND MORE. EGT is also a leading manufacturer of Industrial Sensors from Plastic Injection Molds to Powder coat ovens and even Dynamometer's. Contact us for your Free Quote, TODAY! .250 Bullet Probes Bullet Pro Series Exhaust Probes .250 Dia. .187 Bullet Probes Bullet Pro Series Exhaust Probes .187 Dia. .250 Stinger Probes Stinger Pro Series Exhaust Probes .250 Dia. .187 Stinger Probes Stinger Pro Series Exhaust Probes .187 Dia.